This small, beautiful and unique penthouse apartment directly faces the sea right at the front of this iconic L-shaped Grade II* listed Modernist building, enjoying stunning uninterrupted and panoramic sea views from the living room, bedroom, and the 7.3 x 1.7m private sun terrace. French doors open directly onto the terrace from both the living room and bedroom to make the most of the terrace and the wonderful sea view. We can also offer on-site parking at an additional nightly rate that is cheaper than on-street parking or the nearest car parks, a rarity with Brighton and Hove holiday apartments. Please note that while the apartment can sleep four with sofabed it is ideal for a couple or two adults with up to two children. We cannot accept bookings for three to four adults. The apartment is furnished and equipped to a very high standard with everything you may need for your stay, including high quality Egyptian cotton bedlinen and soft White Company towels. Fast wi-fi is provided throughout the apartment and there are wall-mounted LCD televisions in both living room and bedroom. It has a beautiful bespoke Italian blue granite kitchen and stunning designer bathroom with luxurious under-floor heating. We are delighted to be in Trip. Advisor's top 5 guest of all holiday apartments in Brighton and Hove by guest rating and to hold their coveted Certificate of Excellence. Embassy Court is a beautiful Grade II* listed 1930s Modernist building with a distinctive L-shape, some apartments facing the sea and some apartments looking to the side (this one faces the sea). The apartment is on the top floor of apartments and these were the first ever purpose-built penthouses in the UK, so it has a lovely architectural significance. The architect Wells Coates's top priority for the apartment was pleasure and making the most of the panoramic view so the private sun terrace, windows and glass doors run the length of the apartment giving a real sense of light, openness and space. The bedroom is small but with the uninterrupted sea views pouring through the windows and French doors you can sit up in bed and look out to sea! 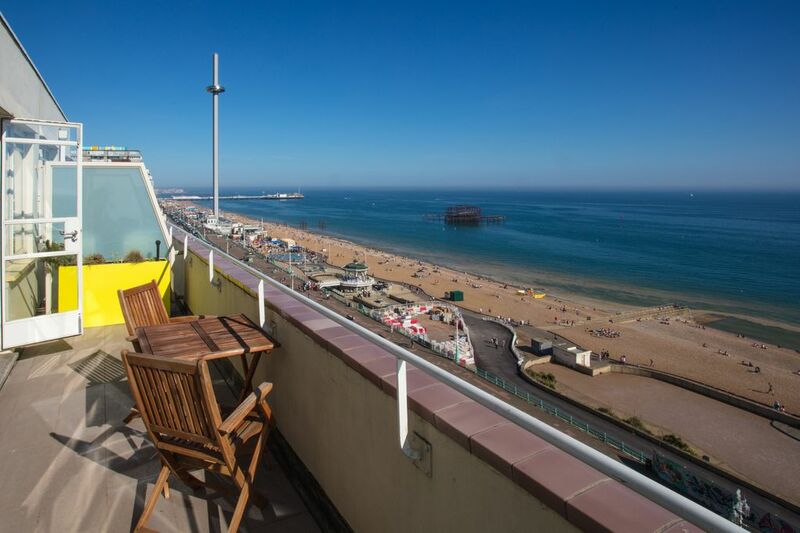 The apartment is close to central Brighton and Hove with all its coveted shops and restaurants, and the Pier and The Lanes are only a short stroll along the seafront. There are many fantastic amenities on our doorstep including one of the best rated restaurants in Brighton (The Gingerman). Waitrose, Sainsbury's and Taj supermarkets are a few minutes walk, Brighton and Hove stations are a few minutes by taxi, Gatwick Airport is thirty minutes by train, and London fifty minutes by train. Fully fitted and very well equipped bespoke kitchen with real Italian blue granite surfaces and Siemens appliances (dishwasher, washer-dryer, fridge-freezer, microwave, convection hob and oven). Far-reaching views across Brighton and Hove to the Sussex Downs. Scandinavian wood floors. Directly facing the seafront, small bedroom with enormous uninterrupted panoramic sea views along the length of the room with doors opening onto the private sun terrace. Comfortable double bed, wall-mounted LCD TV, small wardrobe, Scandinavian wood floors. Beautiful bespoke Italian fully tiled bathroom with luxurious under-floor heating and deep bath with rainfall shower over. Directly facing the seafront with stunning uninterrupted panoramic sea views, fully tiled sun terrace with designer planters from Chelsea Flower Show award winner Fernando Gonzalez, dining seating for two. Please note that the apartment is for the quiet enjoyment of the number and those named on the accepted booking only and parties and gatherings are not permitted. Use of the sofa bed is by prior arrangement. There is lift access but as a listed building with some steps and the lifts being very small we regret that there is no wheelchair access. Travel cot with mattress and highchair provided on request free of charge and the apartment is equipped with children's cutlery, cups and plates. If you are interested in staying with us please let us know your preferred dates and we'll be delighted to come back to you asap. As a small and friendly team we always really appreciate any info you might like to give about you and your trip. Please also note that we cannot accept pets. You will need to provide your own washing powder. We provide a small amount of dishwasher tablets to start you off. Outside: Fully tiled 7.3m x 1.7m private sun terrace, stunning panoramic sea views, designer planters from Chelsea Flower Show award winner Fernando Gonzalez, dining seating for two. Cleaning / Towels / Linen / Maid service: Use of Egyptian cotton bed-linen and White Company towels included. I have stayed at this flat before. I always look forward to walking through the door and be able to look out over the sea. The view is spectacular. And should you want a closer look you just cross the road and you are on the beach. The flat is not big but because it is decorated so well it feels bigger than it is. The flat has everything you need for a stay, regardless of the length. Booking and communication with Olivia was as smooth as it could be. The place is clean and lovingly kept. It feels like a home you are lucky enough to be able to use while in Brighton. Shops, restaurants and supermarkets are a short walk away. The flat is on the top floor so there is no noise from the streets below. The flat is such a oasis of peace and calm. Exceptional views towards Brighton Marina looking east and Shoreham and beyond looking west. Very spacious, clean and comfortable accommodation. The kitchen is really well equipped and the bathroom looks newly decorated, with underfloor heating. I ate breakfast on the expansive balcony each morning and watched the world go by, and watched the sun setting in the evening. Communication before, during and after with the owner of the property was excellent. Cannot fault this property, and hopefully will return for a third stay in the near future. Lovely quiet clean apartment on the seafront. A real treat. Iconic block on seafront. Easy reach of central Brighton, good convenient bus links or short walks. Apartment is really well thought out. Perfect for a couple. All facilities laid on. Being on top meant was quiet. Great location , great balcony overlooking the sea & great accommodation & facilities. Olivia great. Good accommodation & met all our needs. Would recommend to anyone . We stayed in 2017 for the Brighton Marathon (I was running in it), and when I decided to run the 2018 Marathon we didn't even hesitate to book here again. The apartment is just lovely. A fabulous location with amazing views, what more could you ask for? Well if a clean, smart, well equipped apartment is what else you would ask for, then you'll have that too! We are a family of 4 (2 young girls), and it is a little bit cosy for us all at night, but that adds to the fun and the charm. The apartment has everything you would need for a stay, and we had an enjoyable time. Olivia is very helpful too and kindly arranged for a parking space for the long weekend. Would highly recommend staying here, hope we get a chance to again in the future. Thanks! Get a Penthouse for the price of a hotel. We are a firm believer of using private lets where possible, instead of paying multinational Hotel chains for accommodation. The price of this penthouse was approximately the same price of a hotel that was far less superior. The difference is you have a whole penthouse with a balcony, try getting a hotel room with balcony with amenities including sky TV for the same price. The whole apartment is snug, it has everything you need, it is like a home from home. The view from the balcony is amazing, uninterrupted views throughout. The kitchen is well appointed, although we didn’t use it all that much as we are foodies who eat out on every occasion possible. The bathroom is well equipped with additional under-floor heating which is a nice touch on the feet in the morning. Bedroom, although fairly small is suffice for a holiday stay with cupboards to accommodate a trips worth of clothing, TV with sky and a heater if required. The lounge/diner is a good size with Sky TV, a good size settee and a small table for dining. Views from the lounge and bedroom face straight out to the sea front and on a nice day with the balcony doors open you can hear the waves on the sea which I find very soothing indeed. Overall the accommodation was everything we wished for and more. Couldn’t fault the Art Deco building and the accommodation within. The location is just west, up from the main pier, nearer to the west pier. We were first a little worried and as we didn’t know the area we thought we would be quite far away from things to do and nearby shops and amenities, but that was far from the truth. There is plenty up this end and a walk along the promenade also takes you to many attractions. If you are on that extra special stay, we would recommend The Gingerman restaurant which is literally a 2 min walk, we had an amazing tasting menu. We also had a great massage at The Little Jasmine Spa. We would also highly recommend the vegetarian restaurant Terre a Terre for afternoon tea. Don’t forget to take a walk through the North Laines for all those quirky shops. Overall very happy with this stay, a big thank you to Olivia for making sure everything was just right on our stay and our anniversary. We would book again if we popped back to Brighton. So instead of booking that Hotel, go book yourself into a lovely Art Deco Building and get yourself a penthouse. Make the stay that extra bit special, you won’t regret it. The property is directly on the seafront. Brighton and Hove stations are five minutes by taxi, Gatwick Airport thirty minutes by train and London fifty minutes by train. Parking can be arranged on request at extra charge. The flat is a few minutes' stroll to central Brighton and Hove with all its shops and restaurants, the Pier, and The Lanes, and has many fantastic amenities on its doorstep, including one of the best rated restaurants in Brighton (The Gingerman). Waitrose supermarket is a few minutes walk. Booking Notes: £200 non-refundable booking / holding deposit per week and part-week thereafter to secure dates, goes towards rental. Balance and £300 security / damage deposit payable 6 weeks before stay commences. Changeover Day: Flexible. Check-in from 3pm. Check-out by 11am. Minimum stay varies throughout the year. Notes on prices: We have nightly rates for stays of less than a week depending on the time of year, please ask. Minimum stays vary throughout the year.